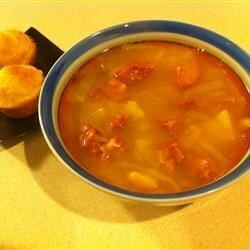 "This is a nice winter soup that will warm you up after being outside in the snow! This is great as a meal with some crusty French bread. I sometimes add a can of white beans." Place the water, chourico, potatoes, cabbage, carrots, onion, celery, canned vegetables, parsley, garlic powder, celery salt, and red pepper in a large pot. Bring to a simmer over high heat, then reduce heat to medium-low and continue to simmer the soup until the vegetables are tender, about 40 minutes. If soup is too thin, stir in cornstarch dissolved in water to thicken. I made this stew and was wonderful. I also sent it to my nurse and she love it too. Just making it now...didn't have the mixed veggies but everything else. Very yummy..will make it again. I also added a can of white beans.